I fell in love with flowering tea at a dim sum restaurant that had the worst service three times then when a friend found a hair in her food, they didn’t apologise to her directly. So I won’t buy it from them (obviously) but I did find it with Ten Rei in Toronto. 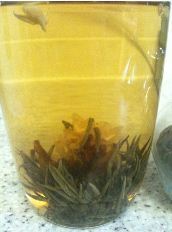 I bought Jasmine and this Summer’s Sun tea. This tea is a bit weak on flavour. 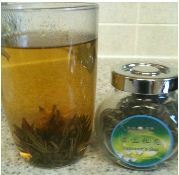 Whereas the dragon pearls jasmine tea has a delicious flavour, this seems to have none. There is an unfermented tea flavour for sure but beyond that the tea is a bit lacking even when allowed to brew for over 5 minutes! I love the jasmine though and so I’d probably buy more of the jasmine but I’m probably not going to venture beyond jasmine flowering tea or dragons pearls again for awhile. I paired this with the Melt Wine chocolate bar which I thought worked nicely with it but the Melt wine chocolate bar is an extremely fruity chocolate which works well on its own too.